Now, even though I was never what I'd call a "shop-a-holic", I was definitely used to spending what I made. I thought as long as I didn't carry a balance on my credit card I was being financially savvy. What I didn't factor in was things like retirement, kids' college funds, having the ability to be a stay-at-home mom, allowing my husband to retire early, being able to donate to charities....you know, the things you don't really think about when you're in your 20's (and if you do, awesome, and please tell me what your parents did so I can replicate that with my kids). So without further ado, here are the behavioral changes I've made in my life to help me spend less overall so my family can realize all these dreams we have. Some are simple "tricks" I use on myself and others are a little bigger, like shifting my focus and mindset. This sounds odd, I know, but let me explain. Sometimes I spend $4 on a gallon of milk even though it should cost $2. This is because I opt to buy it at the local convenient store instead of the large grocery store down the street. Sure, it might cost half the price at the grocery store, but I know that if I step foot in there I'll likely see a new kind of cheese I'd like to try, pick up some sushi from the sushi bar because I'm hungry and it looks delish, oh and I need those beautiful flowers over there, those would really brighten up my kitchen. Before I know it, that $2 savings on my gallon of milk just cost me $30 in extra purchases I didn't plan. So, sometimes I spring for the convenience fee if I only need one or two items. That way I'm not tempted by the tens of thousands of other items at a larger store. I know, I know, you've heard this one a hundred times, right? You know why you've heard it so many times? Because IT WORKS! 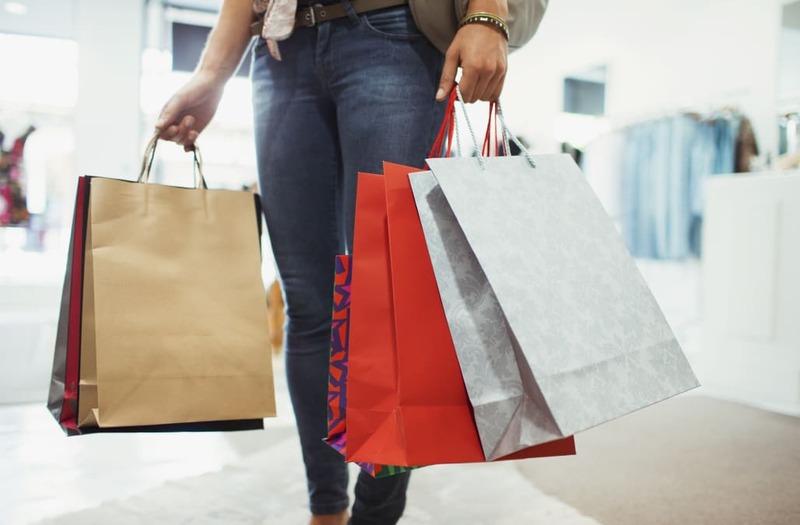 It does take some planning and a little bit of discipline, but it also makes each trip to the store more stress-free and you end up with less unplanned purchases. My husband and I have a shared "note" on our iPhones titled "Groceries" and we can both add to it. When I go to the store I pull it out and start the scavenger hunt. Think Supermarket Sweep (remember that gem from the 90's?). You can do whatever works for you ... create a list in your notes section on your phone, or use the old paper and pencil method ... just make sure you remember to bring it with you to the store and then you can put your brain on auto-pilot once you're there. This pertains more to clothing and home goods than groceries and toiletries. The gist here is, don't buy it if you're not crazy about. I have fallen into the trap of buying clothes because they're on sale and I think I'll wear them. What happens is, every time I go to get dressed I choose one of my other favorite items instead of that thing that I purchased because "it was a really good deal." I've given things to charity with the tags still on. I've spent $50 on a shirt before, but worn it a hundred times. That's fifty cents per wear. I've also bought a shirt for $10 and worn it once. That's $10 per wear. In this case, my more expensive purchase was a better deal because I really liked it. Remember, it's not a good deal if you never end up using it. The same principle applies to shopping. I know that if I stroll into the clothing, shoe or home goods section at Target I will find things that I suddenly feel the NEED to own. So instead of expecting myself to be so disciplined in not buying things, I find it easier to not even allowing myself to SEE those things I might want. It's a mind game ... it's easier to say no if you don't even know what you're saying no to. So what I do is make a conscious effort to avoid other aisles if I'm only there for diapers and don't have any extra "fun money" left in the budget that month. If I do have some money for the month, I let myself look and buy. And believe me, I always find something to buy. Look people ... these retailers are smart. They've done their homework, crunched the algorithms and analyzed all the data. They know what works for them. If they lost money sending out these coupons, they wouldn't keep printing them. There are so many reasons coupons end up making businesses more money. For one, coupons create a sense of urgency and get you in their store (or on their website). They know that once you are there chances are you will make additional purchases. Another trick manufacturers use is math. Here's an example of what I mean by that ... I get coupons for 50 cents off a 12-oz bag of Kraft cheese sticks, but if I buy the 24-oz bag the cost per cheese stick is exactly the same price without a coupon. So I can get the "sale" price by simply buying a higher quantity. Or, if I decide to buy the store-brand (which has the exact same ingredients as the Kraft brand mind you) it's actually cheaper than using the coupon on the name-brand cheese. And let's talk about those Gymboree Gymbucks for a second because I'm convinced someone at NASA has designed this program. The magic is in the way they price their items and the amount of money you must spend in order to get the discount. Somehow you are ALWAYS left with the need to add a $2 item so you can get your discount. But guess what? There are NO $2 ITEMS IN THE WHOLE DARN STORE! So you end up adding a last-minute panic sock purchase for $7 and spending more than you intended. It really is quite genius of them. Now look, I'm not crazy, if you know you need a new pair of shoes and you get a coupon for your favorite shoe store, by all means use it! But unless you already planned on going there and making a purchase, do yourself a favor and throw the coupon out. Don't treat them as a "to-do" just because you see "free money". Stores are like casinos...the house ALWAYS wins. I am a sucker for home decorations. I am constantly adding new chairs, ottomans, tables and art to my "wants list". Alas, I do not have an endless trust fund to dip into and buy all these items as quickly as I can dream them up. But it's a good thing, because more often than not, I end up seeing another item I like better than the first. I end up removing and replacing things on my list constantly. If the same item stays on my list for a year then I can say with great certainty that I really like it and it would be worth spending the money on it. I rarely feel buyers remorse anymore! This one requires a bit more work than the other tips I mentioned above. It requires changing your mindset, and it has been a process for me. This has to do with minimalism. The minimalist way of life is becoming more popular as of late. With people living in tiny houses, documentaries like Minimalism, and challenges like Project 333 hitting the mainstream, people are starting to reject the "consume more" culture for more simplicity. I don't know if I can call myself a minimalist yet, but I'm working towards it. Every time I donate more of my stuff I feel weight being lifted from my life. I still want things, and still buy new things, but I make sure my purchases are well researched, thought about over a long period of time and are truly things I love. I have decided to stop buying more "stuff" and start buying more things that add value to my life. And realizing that perhaps I don't need 24 wine glasses for that one party I might have one day. My kids don't need every toy they love playing with at the library or Jimmy's house because if they have it all at home it won't be special anymore. I recently read an article called How Getting Rid of Stuff Saved my Motherhood and the author explains minimalism so eloquently I just had to include the link. I won't do it any justice by summarizing it. So all you need to do is this simple little thing called, changing the way you think. No big deal. Just kidding, it's incredibly hard, but it's doable. We can take baby steps each day which will add up to miles worth of progress in the long run. Even if you use just one of the seven suggestions, I think you'll find that spending less will help you do more in life. I'm not perfect but I'm much better with money than I used to be. We will be debt-free (including our home mortgage) in less than a year, our children will not need to take out student loans for college, and my husband will be able to retire by 50 if we keep on the path we are going down. That makes my small sacrifices every day well worth it. How are you spending less so you can live more? The post 7 Smart Tips To Spend Less So You Can Live More appeared first on Marriage, Kids and Money.